1940s vintage dress is such a darling! 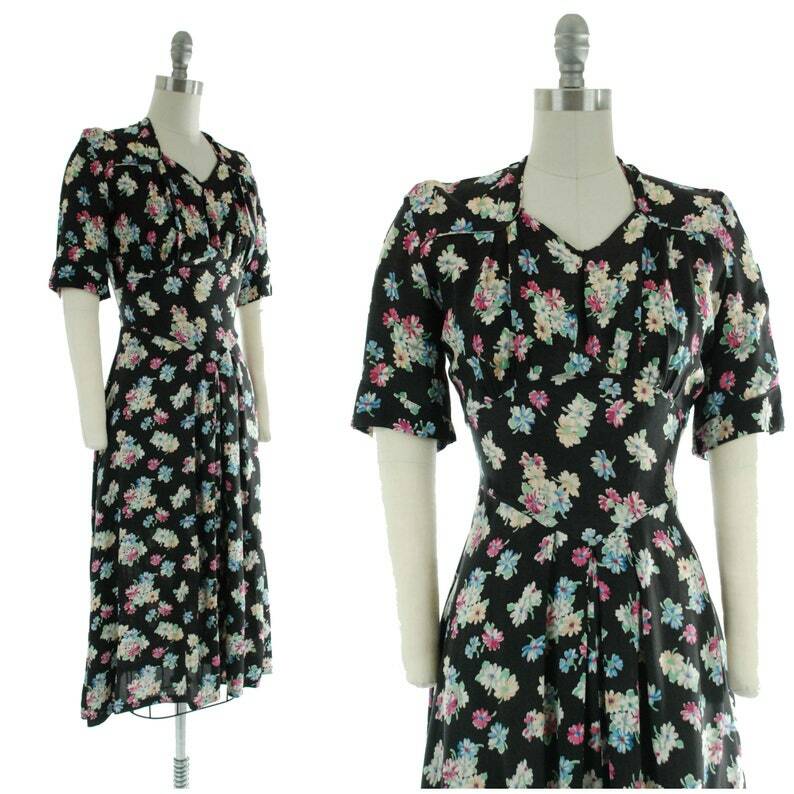 This fabulous black rayon is decked with lovely bouquets of daisies in white and butter yellow, blue and fuchsia and grey with bright green leaves. The sleeves are short and the shoulders have tiny pads - please forgive me, I didn't realized when I photographed this that those pads were mispressed by the cleaners - I have just fixed them. A piped edge defines the front shoulder yokes. The midwaist is a drop style, pointing up to divide the bust, and low to lengthen the waist. The skirt is pleated into the midwaist, and has a lovely drape. This dress closes with a replacement zipper that is relatively modern. This dress is clean and ready to wear. As noted, the zipper is a replacement which was put in for my consignor. The interior selvage is frayed, and there's a few small seam repairs, but nothing significant. There are two small lightened spots on the right side of the waist, and a small lightened area on the left of the waist, possibly from a reaction with a belt. I find no other issues to note!